Now is not the time to go into Ruth Reichl’s outstanding qualities. I’ll save that for another time. 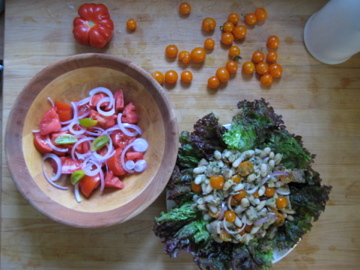 Tonight, I combined two recipes and accentuated them with a few additional ingredients, namely nearly the last of the succulent, sweet golden cherry tomatoes from my last raid on Rosamaria and Emil’s vast tomato plantation, tuna fish, red onion, and red lettuce. This meal is about as summery as food can get. Put beans, water, sage, bay leaf, and whole head of garlic in bean pot or a 5-quart heavy pot. Cover and slowly bring to a simmer over low heat (this can take 2 3/4 hours in a bean pot or 1 hour in regular pot). Simmer beans until tender but not mushy, about 45 mins in bean pot or 35 to 40 mins in metal pot. Remove from heat and cool, covered, for 15 mins. Stir in sea salt. Drain almost all cooking liquid from beans (reserve for another use, if desired). Discard sage sprigs, bay leaf, and garlic, and season beans with sea salt and pepper to taste. Dress beans with olive oil at the table. Divide the beans in half; reserve one half for another meal. Put the other half in a large bowl. Open and drain can of tuna. Crumble into chunks and add to beans. Slice cherry tomatoes in half; add to beans and tuna. Thinly slice red onion, amount determined by you, but I wouldn’t overdo it. Add two generous tablespoons of the arugula puree, but, again, don’t over do it. Drizzle a good slug of olive oil and sprinkle a good red wine vinegar over the tuna, beans and tomatoes. Use a wooden spoon instead of a metal to mix all the ingredients so as not to mash the beans. Arrange lettuce on plates. Divide the salad between the two plates and season with salt and pepper. Serve with good, chunky bread to mop up the juice. This was very yummy and not overly filling. I believe the instructions about adding the salt to the beans at the end of the cooking is important. If you add it too soon in the cooking process, the beans take longer to become tender.